Locality: United States, Florida, Alachua, United States: Florida: Alachua County. Kanapaha Botanical Gardens; The Herb Garden. Open sunny area. Leaves thick, green with white elliptical spots; cut leaves exude light yellow sap. Unopened flowers with orange-red corollas. Open flowers with corollas ca. 3 cm long, yellowish above the middle; stamens exserted ca. 4 to 5 mm beyond corollas. Lat. 29.61201°N Long. 082.40671°W Datum: WGS84. S21,T10S,R19E. Occurrence Remarks: [Common name:] "Aloe Vera; Aloe" --[Label footing:] Voucher for: Floristic Inventory of Kanapaha Botanical Gardens. --[DNA ann. 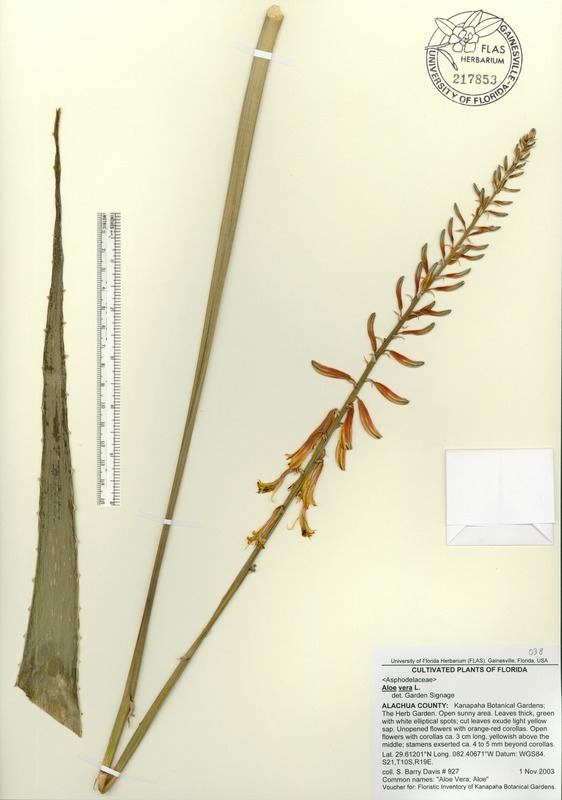 :] Voucher for plant DNA banking and BarFF (Barcoding the Flora of Florida) by J. Richard Abbott, Kurt M. Neubig, W. Mark Whitten, Norris H. Williams & Kent D. Perkins. 2014.